Do you find yourself checking your cellphone almost habitually? Have you ever felt your pocket vibrate and then were surprised that there was no notification? It was just a phantom vibration? Smartphone addiction is a growing problem, especially among younger generations. Perhaps unsurprisingly, this is something that isn’t unique to the USA or other wealthy countries, but is all over the world. It’s not uncommon to see groups of people out at the bar at night and they spend more time on their cellphones than talking to the person in front of them. The scenes are the same from Seattle to Medellin, or from Alaska to Argentina. Look, I love my smartphone. I love social media (for the most part). I love easy access to news, communication, or even work. The internet is obviously the driving force behind being a travel blogger or a remote worker. But I’ve also noticed how big a distraction the internet and a smartphone can be for me personally. There are times when I want to or know I should be working on either personal projects or freelance gigs, but I find myself scrolling through Facebook, checking Instagram, checking a few news sites, checking the statistics for my website visitors, and then repeating the whole process again just to see what’s new. While I have no plans (or desires) to completely eliminate my smartphone from my life, I do think it is good to moderate my activity or at least reduce distractions. 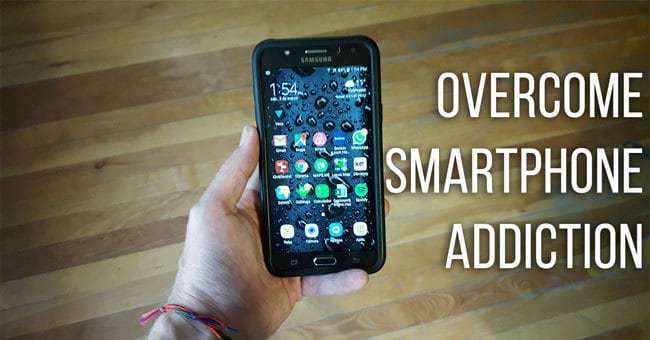 If you’ve been unhappy with your own smartphone usage, then these tips might help you with how to overcome smartphone addiction, or at least bring it back to more reasonable levels. For me, this is the big one. You check the time on your phone, or are doing something on your phone (maybe even semi-important) and then in comes a notice from Facebook, Instagram, Twitter, email, or any of another dozen applications. Just turn off notifications from those individual apps entirely. Nothing pops up at the top of your phone, but you’ve still got access to them when you want. I turned off notices for email, Facebook, and Instagram, since those were the apps that most frequently buzzed or left notices at the top of my phone even in Do Not Disturb. I still get buzzes for more important things, like WhatsApp which is what I use more for communicating with friends or family. Even better for reducing the temptation would be just deleting the apps, or maybe just deleting the ones that aren’t that important to you. For instance, I deleted Twitter, Pinterest, and Facebook from my phone. I don’t have any real reason to have it, just another discuss for distraction. While I still use those social networks for my blog, I just have to go and check in on a laptop computer instead. Even if you silence all notifications on an app, there are still some apps or operating systems which will put the annoying little red icon with a number in the middle telling you how many notices, likes, comments, etc, you have waiting. Simply seeing these icons even while you are doing something else will inevitably create curiosity and make you open the app to see what/who the notifications are from. I used to keep Facebook and Instagram on the main home page of my phone, but any time I opened my phone I’d see those notices, even after turning off notifications. So I just removed them from the homepage where I have my most used apps and now they are buried under all apps, sorted alphabetically and not seen as often. It might seem counterintuitive to install yet another app if you are trying to curb your smartphone addiction, but there are a number of apps out there designed to help you . One that I use is RescueTime (which is also installed on my computer) and which tracks how long I spend in various programs/apps or various websites. Simply knowing how much time you spend/waste in a given day or week can do wonders for bringing awareness. Most of us will drastically underestimate the true amount of time we spend within this apps. Even desk workers often spend a good chunk of time every day at the office either on social media on their computers or on their cellphones. Even though I work from home or for myself, I’m still not immune to that pull. By no bars I mean no signal… Get away every once in awhile to go camping or hiking where you have no signal whatsoever and won’t have the chance to check it. I found back when I was attached to the hip to my Blackberry for work (and had my own smartphone, double trouble) that the weekends away in nature did a lot to help keep me feel balanced. Today, I frequently find myself in zones without service thanks to my constant travels and the fact that I don’t have a data plan and must rely on WiFi. All of the above are what I’ve personally done to reduce my tendency to grab for my phone (notice I didn’t say eliminate). But there are other steps that one can take to help reduce usage. Rather than being able to quickly unlock your phone, create a large and annoying password with upper/lowercase, numbers, and special characters that is particularly long. I use my phone for my watch and alarm clock, which isn’t ideal. Putting a watch on your wrist will reduce the need to grab for the phone (and fall down the social media rabbit hole). Leave your phone in another room or turned off entirely before bed time in order to get a better night’s sleep and reduce the need for endless scrolling. The bright blue light that glows from a cellphone (or other screens) is proven to disrupt the release of sleep-inducing melotonin, make you more alert, and disrupt the body’s circadian rhythm or internal clock. I like to read before bed, and sometimes I don’t always have my Kindle on hand, so I turn to the Kindle App on my phone. For that reason, I installed the Twilight App which reduces the blue light (making it more reddish) and dims the light significantly. Other cellphone screens are just surprisingly bright and hurt my eyes now, even though mine used to be the same. Turning off the notifications as mentioned earlier also helps me maintain concentration in the book (rather than feeling that vibration and wondering what’s new). Look, I love cellphones and can’t imagine going back to the old days, but I also recognize that their ease of use, utility, and ability to distract can hold some serious negatives as well. I think we can all agree that more time in our real life is better than being sucked in by the digital life, social media, and so forth. What do you do to manage your social media or smartphone use? Any tips or advice to share? Sound off in the comments below. 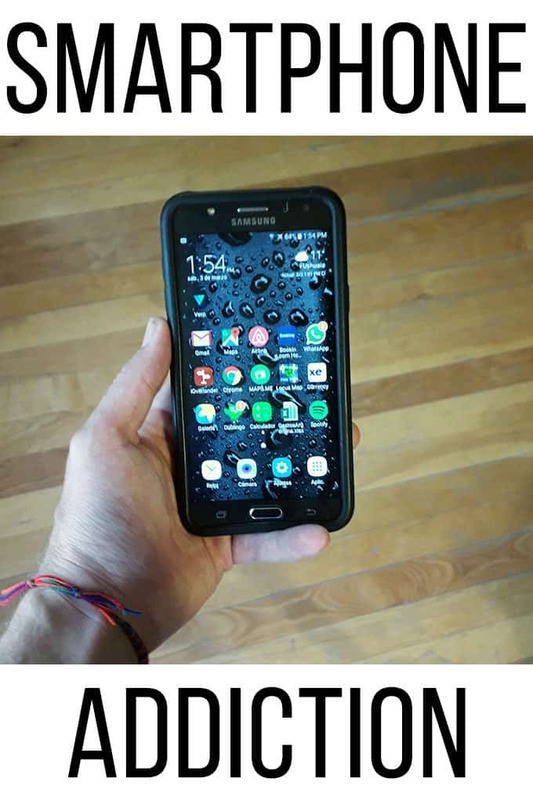 Enjoy this post on how to overcome smartphone addiction? Share it on Pinterest, Facebook, or Twitter. Maybe it will help someone. Hey Ryan, love these tips and awareness! Lately I’ve become more focused on putting my phone down and paying attention to real life, which helps with my happiness level. One thing I’ve loved is setting both my computer and phone to greyscale – the lack of fancy colors makes the device actually less compelling to look at. The real world is in color, after all! On Android you can access this thru Developer Settings (Google how to do it) under Simulated Color Space (set to monochromacy). On Ubuntu I use Compiz Config to reduce the luminance (I think). On Mac and iPhone you can probably use the Accessibility settings to do something similar, and on Windows I imagine there’s a solution that can be Googled…anyway, worth doing! It helps me feel less interested in using my phone, and engage more in the real world. An easier way to do “no bars” whenever you want is to just put it in airplane mode. That means no wifi either. And better yet, the battery life in airplane mode lasts forever. I keep my phone in airplane mode about 50% of the time and my life is way less stressful. That’s definitely a good tip, something that I do at times as well, although I find it hard because my intention isn’t to not be reachable to important people whether through WhatsApp or phone calls. Plus you got to have good self control to not just turn off Airplane Mode, but if it works for you, that’s awesome!